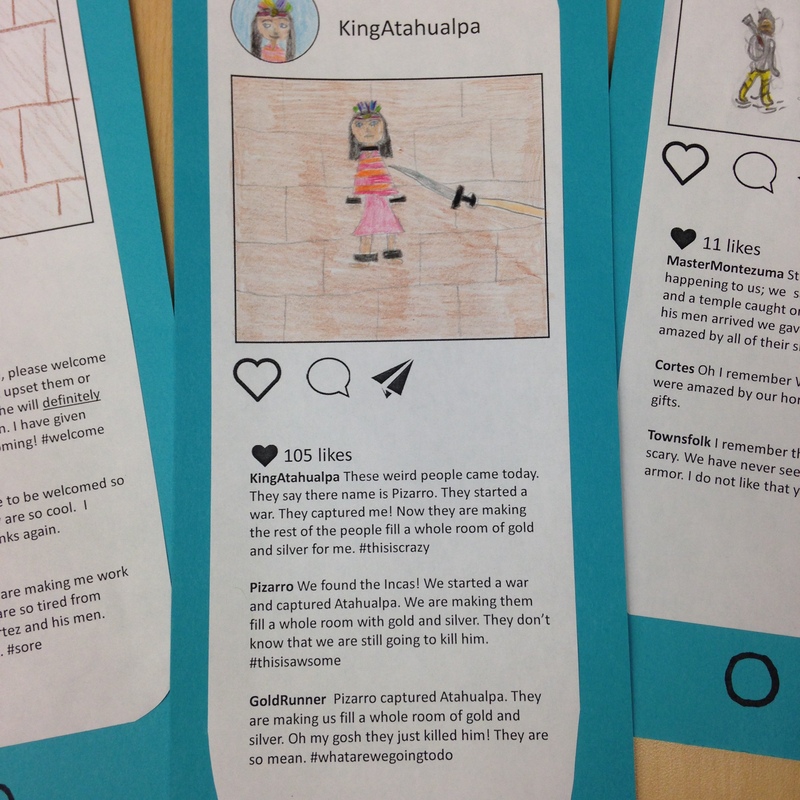 If Montezuma had an Instagram account, what would he say when Cortez arrived in 1519? My fourth graders have some ideas. We are finishing our study of the conquests of the Inca and Aztec empires and have been reading about Cortez, Pizarro and the events that took place in the 1500s when the Spanish arrived in Mexico and Peru. 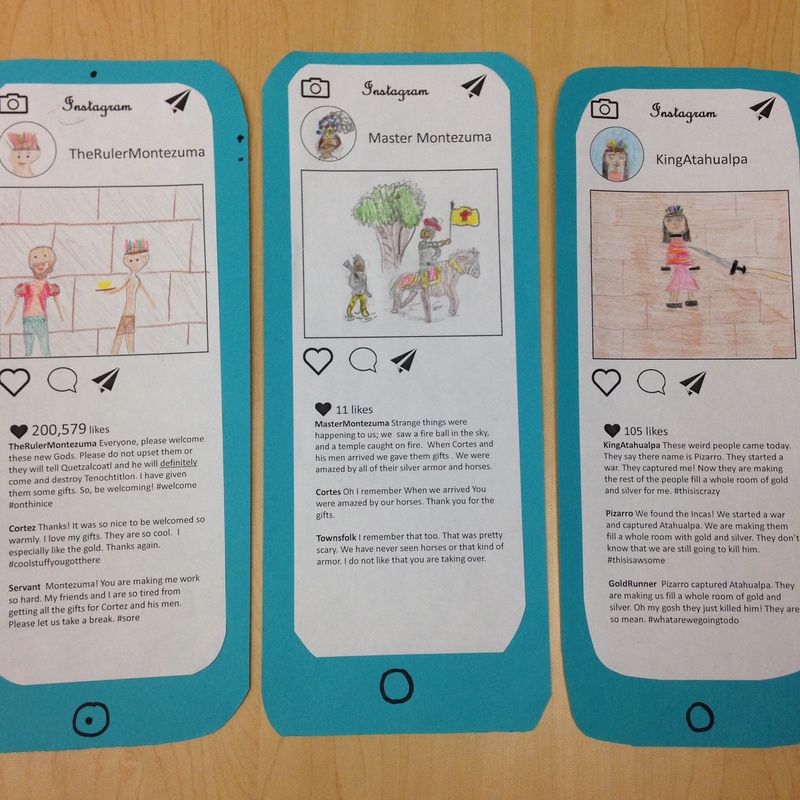 Students took the information they had about Cortez’s encounter with the Aztecs and Pizarro’s contact with the Incas and created Instagram posts from the point of view of the leader, the conquistador, and a common citizen or soldier. The students wrote comments that shared knowledge of the time period as well as demonstrated point of view and perspective. 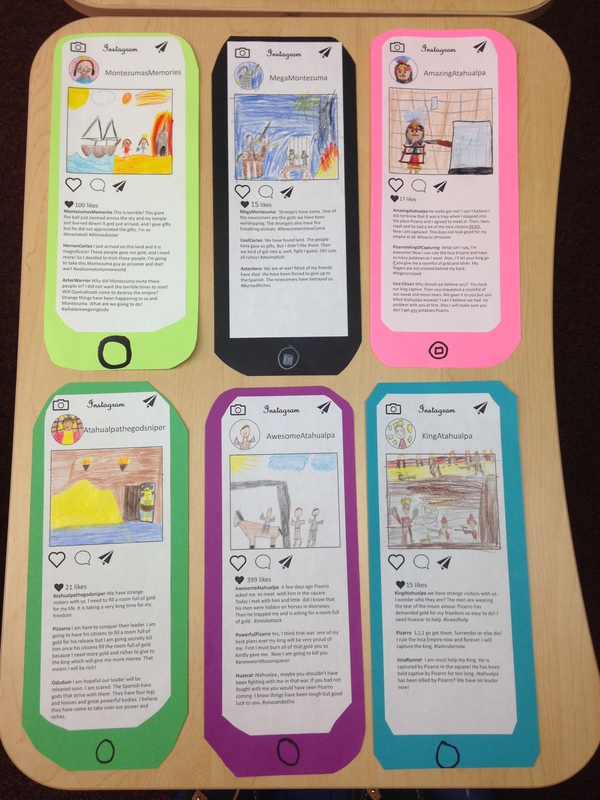 In order to create the Instagram posts, I shared a template with the students in PowerPoint. It had a permanent background with text boxes layered on top. 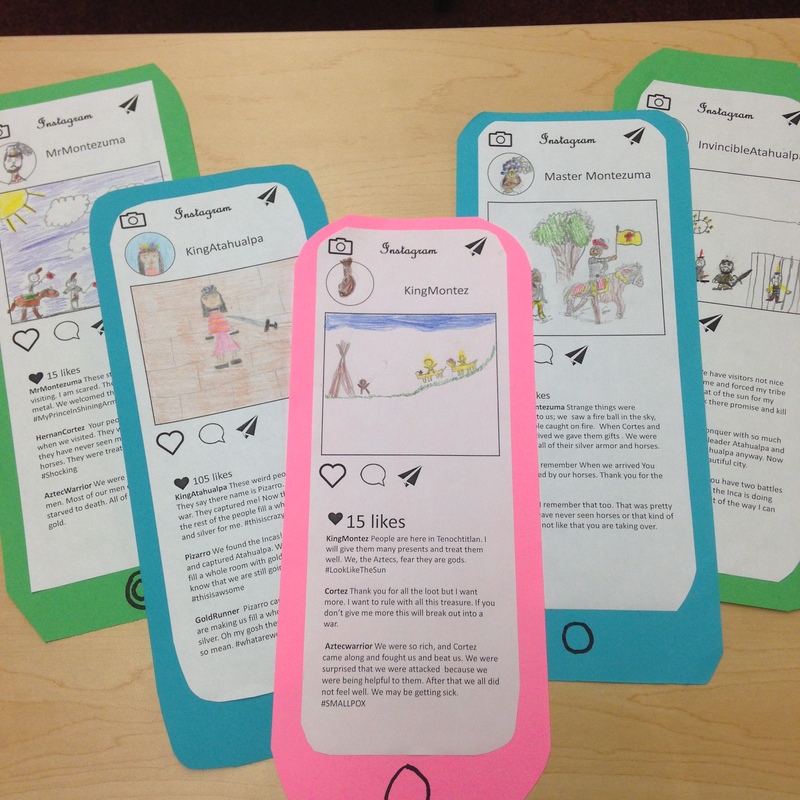 The students clicked in the text boxes to create the usernames and three comments. The first comment was from the Inca or Aztec leader. The second comment was from the conqueror, and the last comment was from a person who would have been at the scene. The students were also allowed to create related hashtags. After students typed their comments, they printed the Instagram post. I set up the template, so the Instagram post filled the left side of the paper only. Using a paper cutter, I cut the paper into a strip about 4 1/4 inches wide. I also trimmed about 1/2 inch off the top. I cut colorful construction paper into strips that were 4 3/4 x 11 inches. With scissors, the students rounded the corners of the construction paper. They also had the option of rounding the corners of the printed Instagram post. They glued the Instagram post to the construction paper centering the white strip closer to the top of the paper. With a Sharpie, the students drew a circle for a home button at the bottom of the construction paper to complete the effect of an iPhone. Students colored a profile picture and drew a scene that matched the comments. The details in the drawing were based on information from the readings and unit of study. 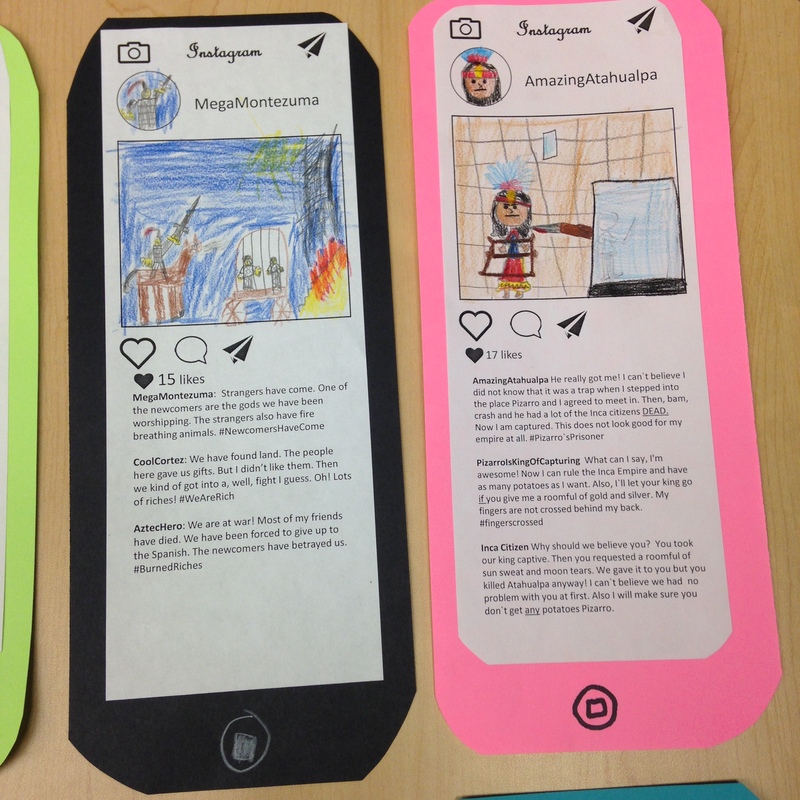 The finished Instagram posts have been so much fun to read and have made the material much more personal for the students. The activity idea is great because it can be adapted for almost any historical figure or time period you may be studying. CLICK HERE to make a copy of the electronic template via Google Docs. 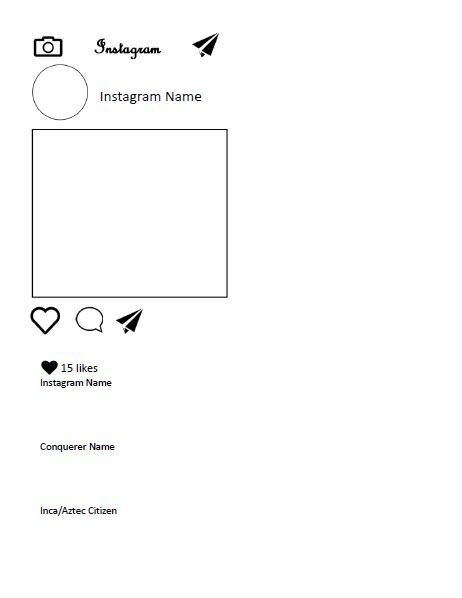 If you would like a PDF version of the template and have students handwrite their Instagram posts, CLICK HERE.